Clay artist Richard Busch is the owner of Glenfiddich Farm Pottery, located in a converted 175-year-old former dairy barn on Catoctin Mountain, just west of Leesburg, Virginia. 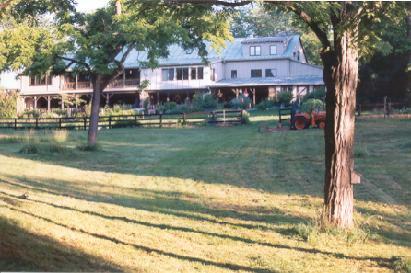 The farm is still in use. Today, horses graze the property's 20 acres and there is a sizeable flock of colorful chickens, which have free range of the back meadows. Glenfiddich (pronounced glen-FIDD-ick) is the Celtic word for "valley of the deer," which is appropriate since deer are frequently seen here. Pots are stamped with a deer symbol. At certain times of the year, we are also lucky to see wild turkeys, which were once so bountiful that the original tenant farmers called the farm Gobblers' Knoll. This view of the converted dairy barn (right) was taken from the meadows where we raise vegetables, herbs, and chickens for their eggs. All the chickens and roosters have names so they are not destined for the soup pot. There is also a sizeable farm pond stocked with fish, which is a haven for wildlife including herons, kingfishers, fox, raccoons, and herds of deer. 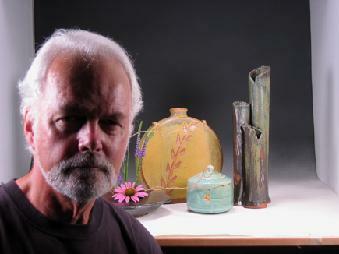 A former magazine editor, writer, and photographer, Richard has been a potter since the 1980s. Though he sells his work primarily from his studio by appointment, his pottery is also available to collectors through various galleries and juried exhibitions around the country. He also holds two annual studio sales, in June and December. 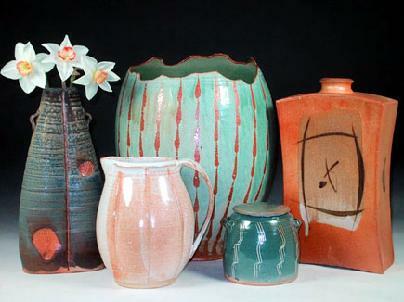 Richard has studied and/or taken workshops with a number of master potters, including Sybil West, Phil Rogers, Michael Simon, Byron Temple, Cynthia Bringle, Malcolm Davis, Mackenzie Smith, Ruthanne Tudball, Seth Cardew, and Paul Soldner, among others. He cites as his strongest influences the work of the English potter Bernard Leach and particularly the Japanese potters Ogata Kenzan and Shoji Hamada. Long an admirer of the Japanese esthetic, he has traveled to Japan to research and write about Japanese pottery. 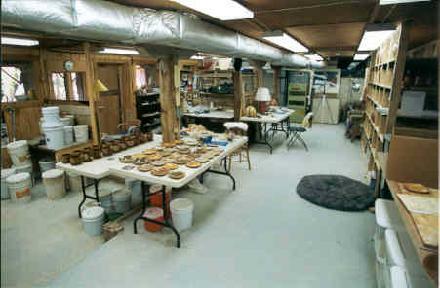 Richard's pottery -- a variety of items including vases, bottles, bowls, plates, teapots, covered jars, planters, sake sets, and others -- is fired in a 30-cubic-foot propane-fueled salt kiln that he built in 2000. (See "About Salt Firing") He fires the kiln about every three weeks, or roughly 16 times per year. The ACV comprises 18 trails scattered around the state. There are 134 members on the Loudoun Trail. These are comprised of individual artisans, art galleries, agri-artisan farms, markets, local restaurants, lodgings, wineries, breweries, and distilleries. Ninety-two of the total are artisans and/or galleries. wheel-thrown and hand-built pottery. Located in the lower level of the renovated barn, the large space was formerly the stables for the farm's working horses as well as for boarding riding horses including a race horse. Today, the horses boarded at Glenfiddich Farm have use of the new stables located in the adjoining meadows. The studio and showroom are open to the public. Please call ahead to let us know that you want to visit. That way you can be assured of someone being here to welcome you.